Ma Cong in the studio with Tulsa Ballet. Courtesy Tulsa Ballet. Without him we wouldn't have The Nutcracker, Swan Lake or Sleeping Beauty. But how much do you know about Pytor Ilyich Tchaikovsky, the man behind classical ballet's most recognizable music? Did you know that the Russian composer hid his homosexuality for much of his life? He also struggled with depression; there's been speculation that his death in 1893 was in fact a suicide. Tulsa Ballet resident choreographer Ma Cong dramatically recounts his life in a new full-length ballet titled Tchaikovsky: The Man Behind the Music, premiering March 29-31. If you think a story ballet about the most renowned composer of story ballets set to, yes, a Tchaikovsky score, is a bit meta, you wouldn't be wrong. But considering the renewed importance of LGBTQ rights in society, it's a ballet perfectly timed to our era. 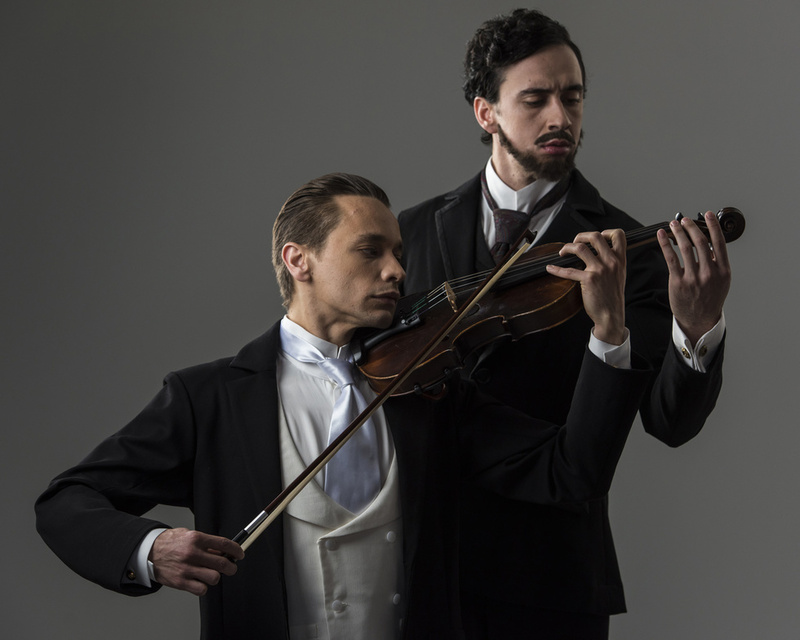 In Russia, censorship still asserts that Tchaikovsky was not gay. The subject also calls to mind backlash surrounding an LGBTQ-themed work at Louisville Ballet just last month. We talked to Cong (the man behind the movement behind the man behind the music—see, we told you we were being meta) to hear all about his boundary pushing creative process. How did the idea for a Tchaikovsky ballet come about? Marcello Angelini and I talked about doing a full length and went through all the fairy tales, but we landed on Tchaikovsky. A lot of people know about his music but not his life. The most interesting thing for me was that he had a double identity. To the public he was an amazing and internationally known musician. But underneath, being a gay man during that time was such huge pressure. Really dramatic things can push artists to create extraordinary work; I think that happened to his music. What parts of his life did you choose to focus on in the ballet? The story centers on three of his most important relationships. There's an opera singer named Désirée Artôt. Early on Tchaikovsky really did express interest in dating women, and through Artôt he discovers his sexual identity. But due to societal forces, he could not speak out. Then there's his secret lover Iosif Kotek, a violinist who helped Tchaikovsky compose his violin concerto. In the second act, I put Antonina Milyukova into his life. Antonina is Tchaikovsky's students who falls in love with him and writes him love letters for years. When he's at a critical juncture, he receives a letter from her saying "I love you so much, please marry me." And that's like a sign: Better to cover himself and not to destroy his career. So he married Antonina and there's a wedding scene and a bedroom pas de deux. But they separated very soon after; it's very complicated. Wedding scenes and bedroom pas de deux are pretty standard tropes in story ballets. How are you modernizing them here? I wanted to maintain the late 19th century Russian classical aesthetic, but at the same time have a modern touch. I invited Tracy Grant Lord, a very brilliant costume and set designer from New Zealand, plus lighting designer Matt Marshall from Australia. They're very good at the modern look. And for the choreography itself, I tried to not do the mime scenes, for example. People point to a finger and it means you're married. They cross their hands; you're dying. I dislike those things because I think they're old fashioned. I tried to use the body and the dancers' acting skills, to put more theatricality in there. I think that's what I'm looking for in this ballet, for it to be very easy for people to understand. What sort of research went into crafting the story? I did a lot of online reading about Tchaikovsky's life and career. I watched documentaries and other dance productions about his life like Boris Eifman's version. Marcello also invited Russian history expert Daniela Kolic as a consultant and composer Oliver Peter Graber to put the music together. Tchaikovsky is part of the reason we have classical ballet. Was it intimidating to take on his story? Not so much. I think his own music tells the story of his life. I learned that right before he died he composed his sixth symphony, which is his most dramatic and successful. And that's coming from his relationship with Antonina, which was so intense. And we used the violin concerto he composed with Kotek for the male pas de deux between them. I do feel that this ballet has a message: Be brave with your sexuality and to be who you are. Especially doing this in Tulsa. Why especially in Tulsa? Do you think people there won't be receptive to the theme? I think it's half and half. Tulsa is very educated in the arts. But we live in the bible belt, and some people don't want to talk about homosexuality. This ballet is going to really open discussion for this. I crafted it in a refined way, so I don't think it will be shocking. But I feel like the ballet will inspire people to understand that love is love. Or at least I hope so.